Impressive, exotic flowers to create paradise in your garden. 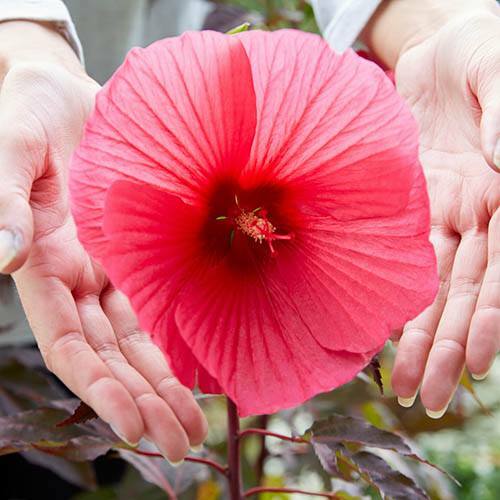 Create a tropical paradise with this giant-flowered Hibiscus moscheutos 'Carousel (R) Pink Passion'. Massive, vibrant pink, exotic blooms up to 18cm across in spring. Easy to grow, and needing very little in the way of maintenance, this tropical-looking beauty is hardy down to -15C. Perfect whether grown at the back of the border or in a large pot on your patio, striking, purple foliage makes this a stunning garden addition even when not in flower! Supplied as established plants in 2L pots, and ultimately reaching an approximate height of 1.8m. 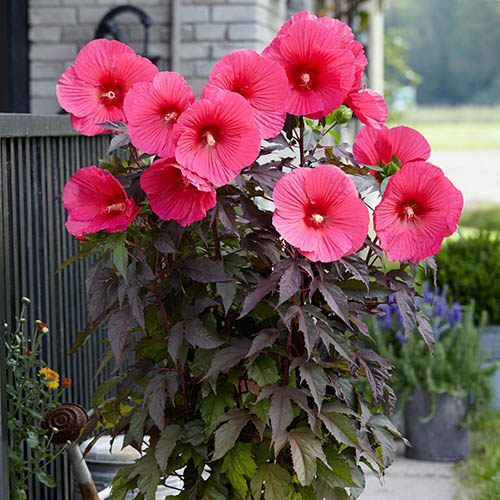 Create a tropical paradise in your garden this year with this giant-flowered Hibiscus 'Carousel (R) Pink Passion'. Perfectly suited to the UK climate, these blousy beauties are hardy down to -15C, and sport an abundance of impressive, exotic blooms up to 18cm across in spring! With striking, purple foliage this hibiscus makes an absolute statement in your garden, and is perfect whether grown at the back of the border or in a large pot on your patio. Easy to grow, and needing very little in the way of maintenance,'Pink Passion'is decked in magenta-pink flowers with a darker, cerise middle and adds gorgeous colour wherever it is planted. Supplied as established plants in 2L pots. To enure plenty of flower buds, 'Carousel (R) Pink Passion' does best in a sunny position, sheltered from strong winds.